Custom requests are when I have the most fun. In this particular case, it was extra fun because I was making my husband’s anniversary gift! 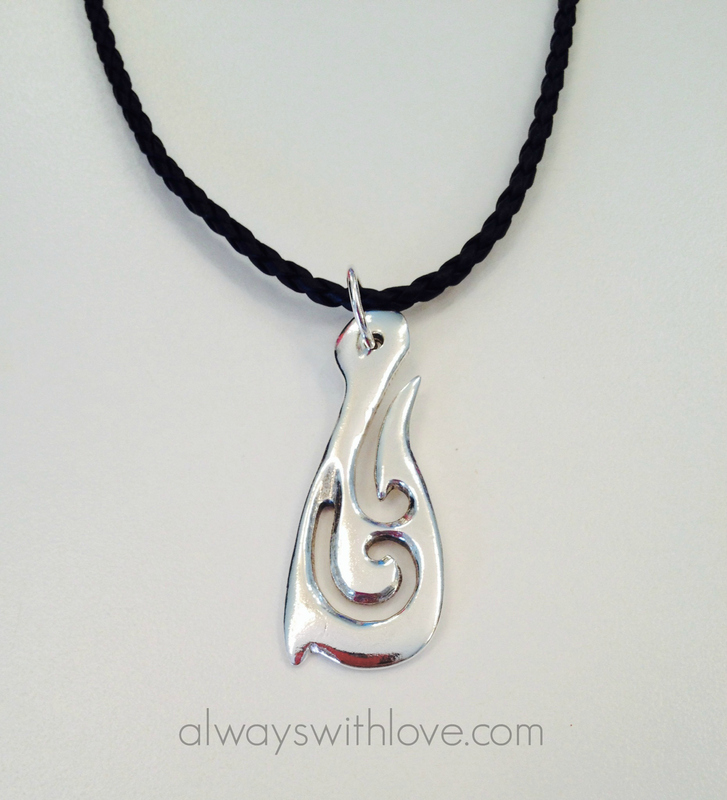 He already owned a Hei Matau pendant made out of bone and wanted it in silver. Since bone is very fragile, I couldn’t make a mold “the regular way”. 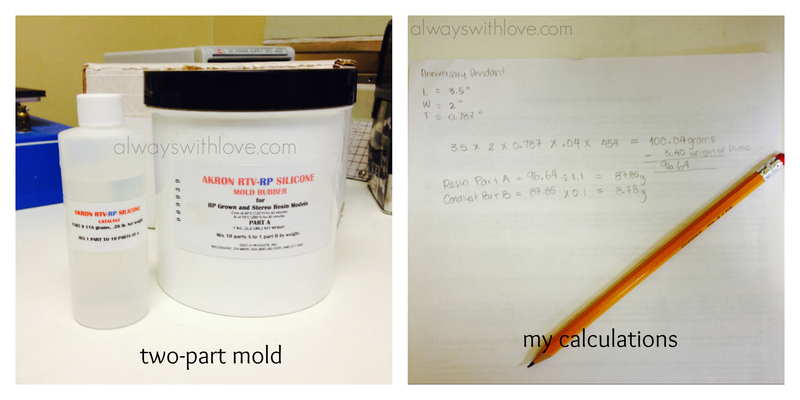 Normally I would use silicone rubber and make a mold using a vulcanizer. However, in this case, the vulcanizer’s heat would have pulverized the bone and ruined the mold. For this reason I had to use a special two-part resin mold that cures at room temperature. 1. 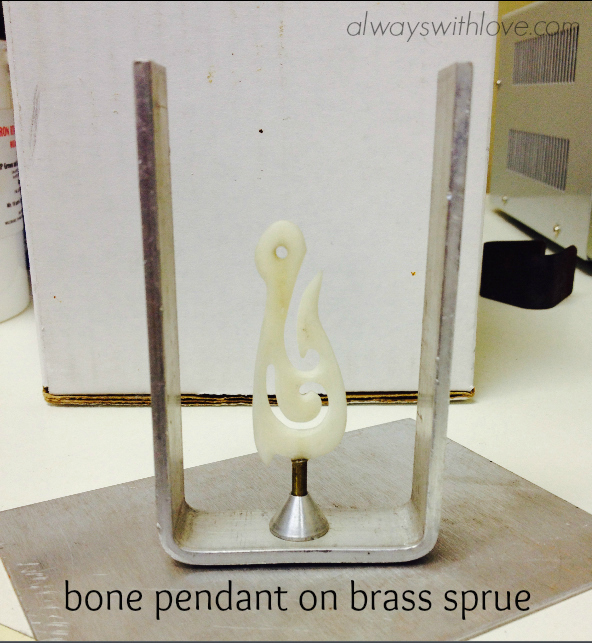 I applied Super Glue to the bottom of the bone pendant (hei matau) and attached it on a brass sprue. 2. Took two aluminum plates and covered the frame. Placed two small clasps on each side to hold the frames tightly. 3. Mixed the resin and the catalyst according to the manufacturer’s instructions. After mixing I placed the compound in the vacuum and removed as many bubbles as I could. Even after vacuuming, the sucker had TONS of bubbles I couldn’t remove! 4. Poured mixture in the frame until it covered the piece. You can see the bubbles I couldn’t get rid of! Urgh!! I set it aside and waited 16 hours for the mold to cure at room temperature. 5. 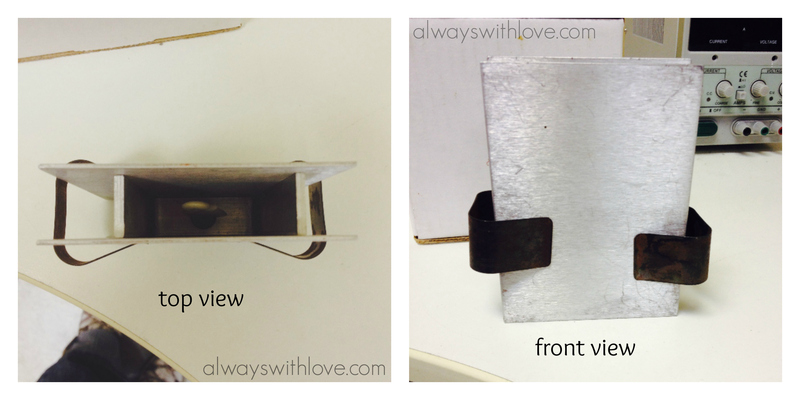 Removed mold from the aluminum frame and cut it open with an exxacto knife. 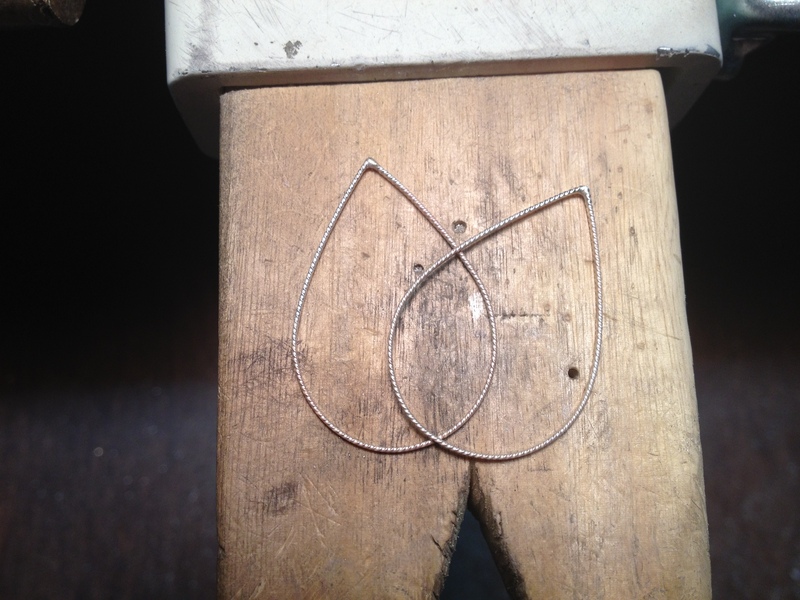 Took the pendant out and examined the mold. 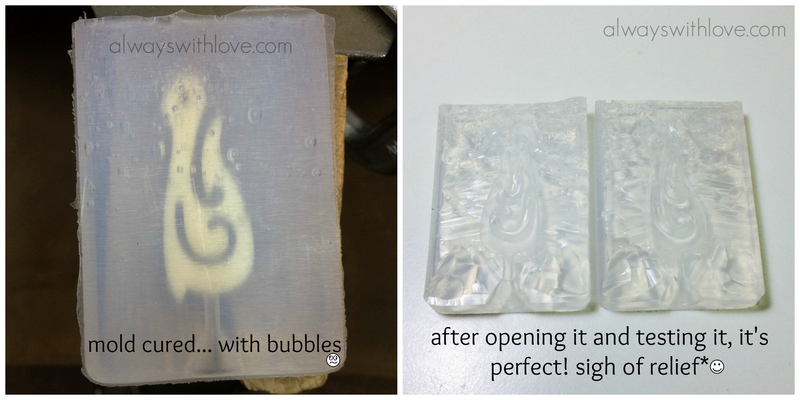 You can see all the bubbles that didn’t come out at the top of the mold. Here’s when I started freaking out. By some miracle from above, none of the bubbles touched my mold! wohoo! Thank you Jesus! 6. 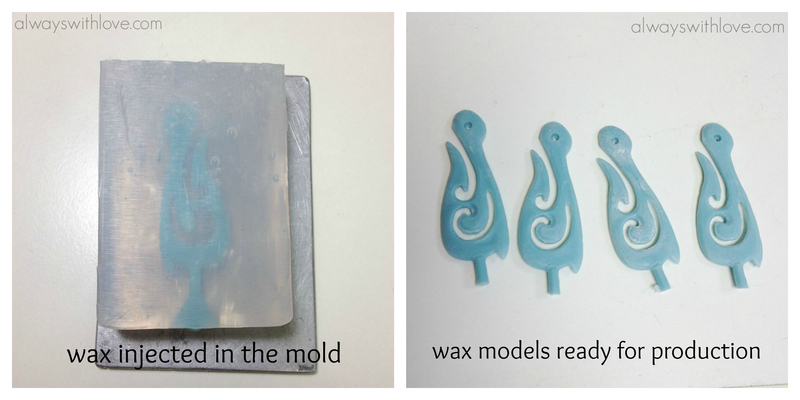 Injected the mold with wax 5 times. Hubby gave me the green light to produce more than just his gift. So 4 of these babies will be up for sale soon! Woot! 7. 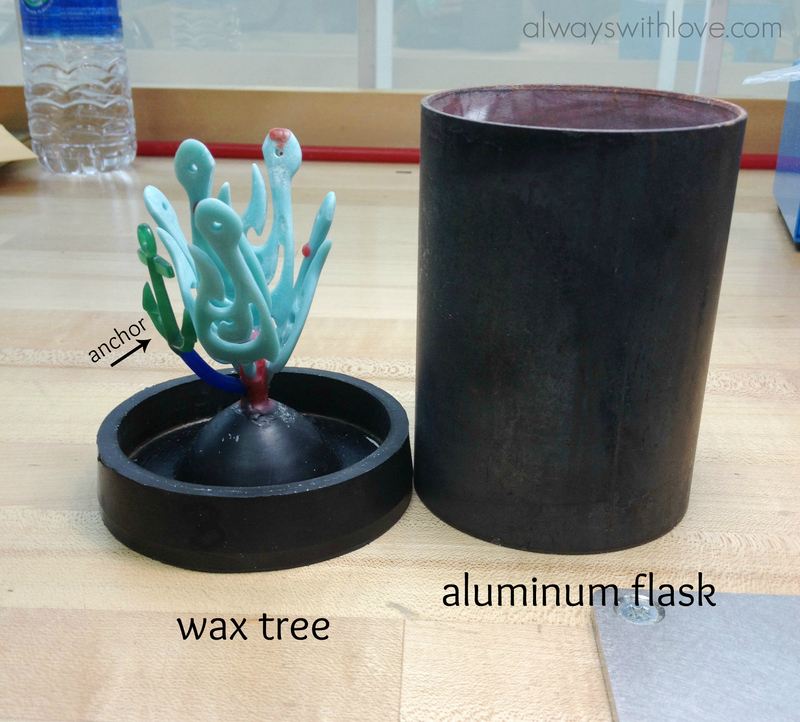 Then I made a wax tree out of the wax models that I was casting in silver. Notice the green anchor? That’s another custom order! 8. Filled the flask with investment, placed it in the steam dewaxer for 1 hour. Once the timer was done I put it in the hot kiln and waited patiently for the 5hr burnout process to be completed. 9. After a loooong burnout process the wax melts and the investment hardens leaving and empty cavity in the shape of the wax models. 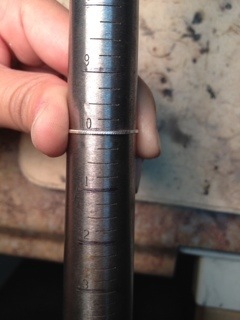 This cavity is then ready to be filled with melted silver using a centrifugal casting machine. I put the flask in the spincaster and melt the silver. 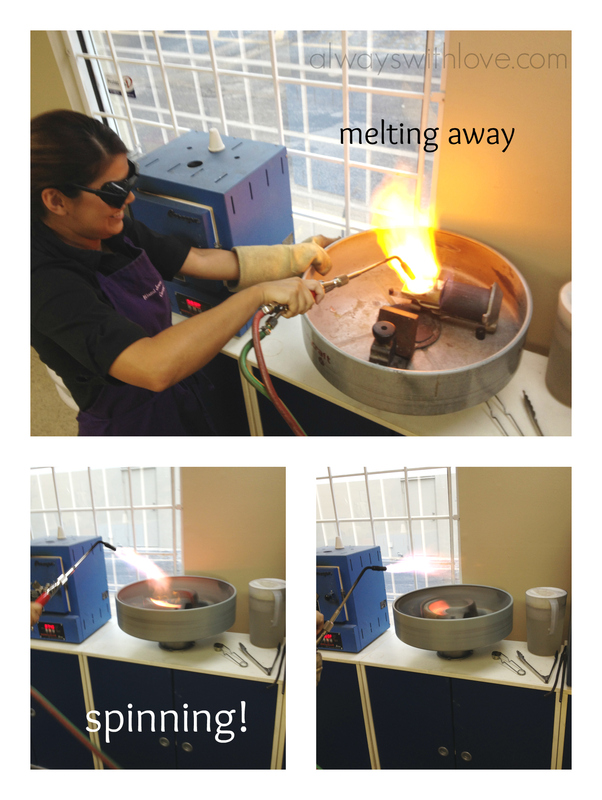 Then when the silver is liquid, I let the casting machine spin and the centrifugal force shoots the melted silver in the flask filling out the cavities. So awesome. 10. After submerging the scolding hot flask in water, the investment dissolves and the cast silver pieces come out with ease. They are black from oxidation and, to remove it, I put them in an environmentally safe pickling solution until they turn white. 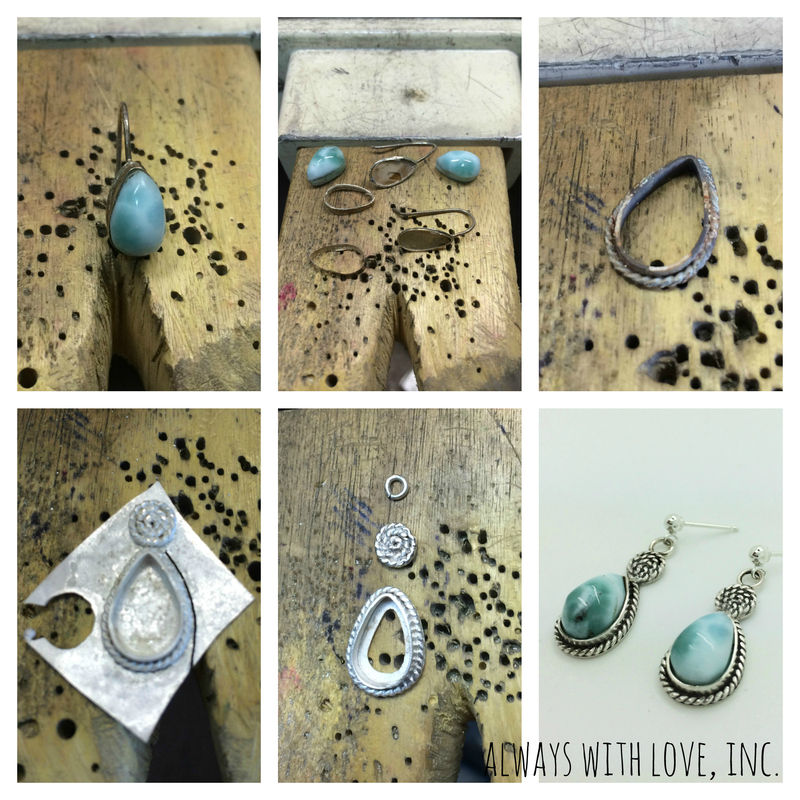 Cut out each piece with the jeweler’s saw and keep the scrap silver for future pieces. Nothing is wasted. 11. File, sand and polish the piece. 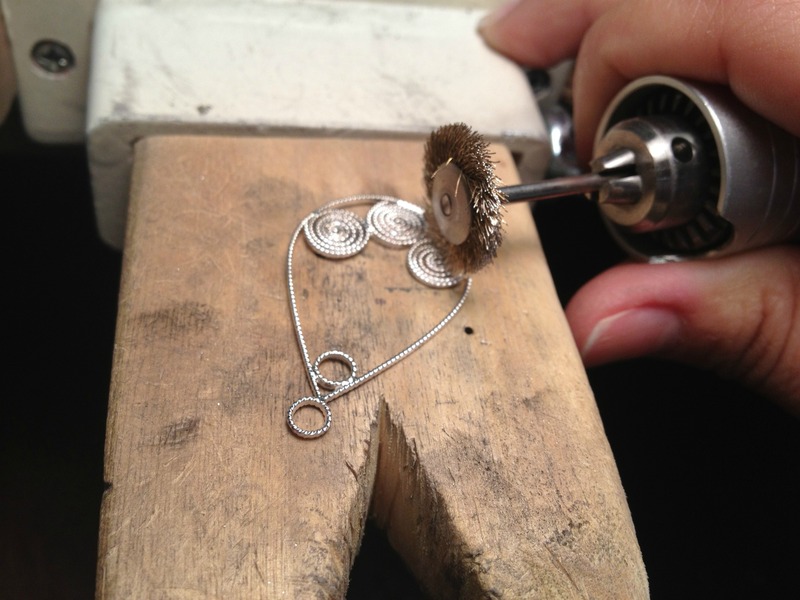 Here I am polishing the pendant. 12. Clean in the piece in the ultrasonic and done! Phew! Casi que no! Happy anniversary! 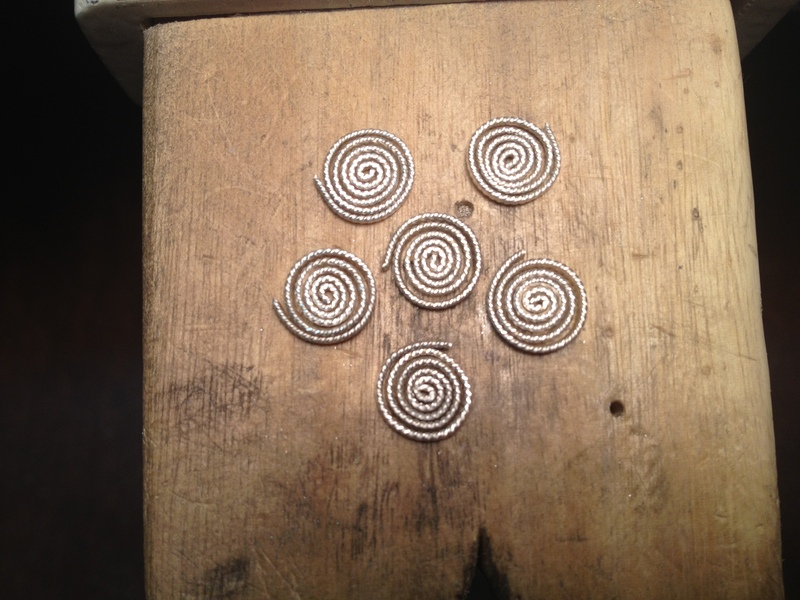 It’s earring making time again. Since I am in tutorial mode, I decided to document the fabrication process so sit down, relax and enjoy the picture show. Soldering station (torch, propane, oxygen, the works). 1. 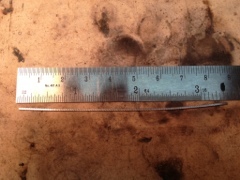 Cut 2 pieces of filigree wire to measure 3 3/8″ long with flush cutters. 2. File both edges flat to remove the grooves the flush cutter left behind. 3. 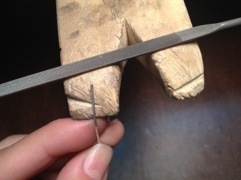 With a ring mandrel set the center of the wire on the size 10 mark and bend wire so that the joints touch. 4. Flux, and “easy” solder the joint. Quench in water and Pickle. 5. 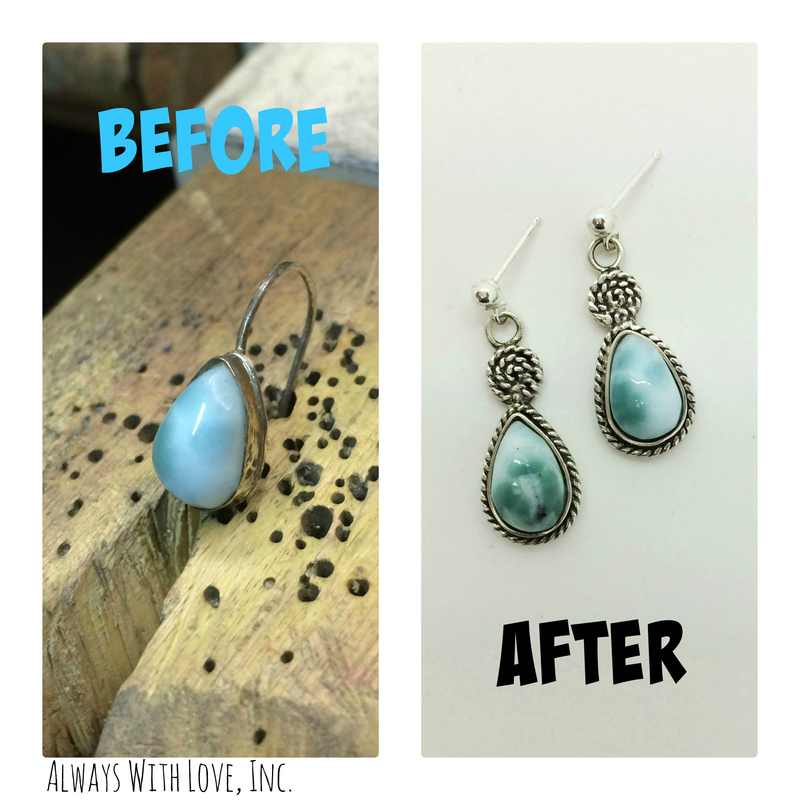 Re-shape it with the mandrel and flat nose pliers. Give it a nice teardrop shape. 6. 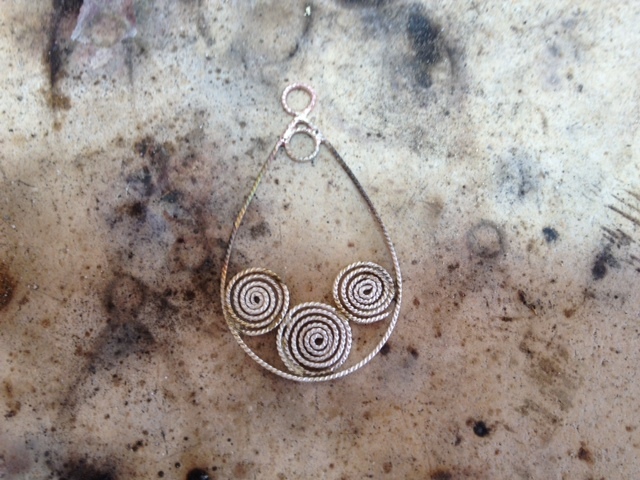 Make 3 coils for each earring turning the wire as snug as possible. 7. 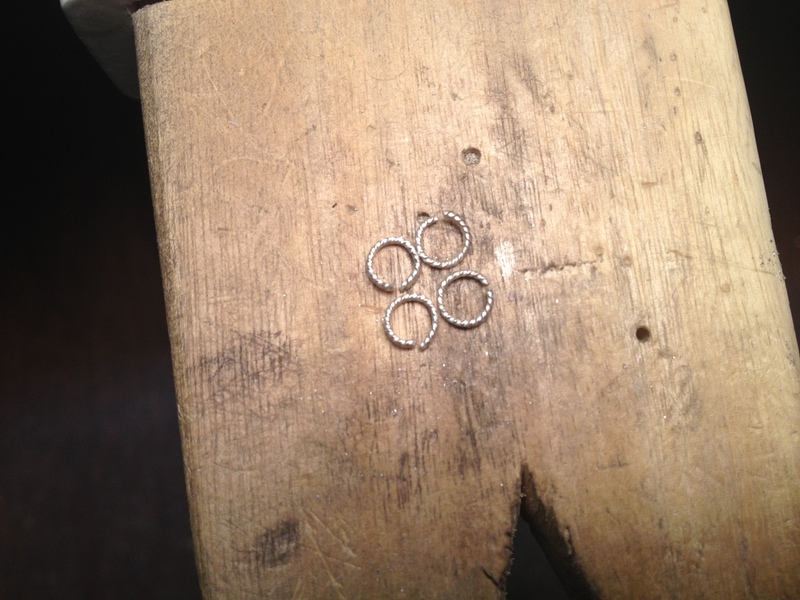 Now make 6 round jump rings. 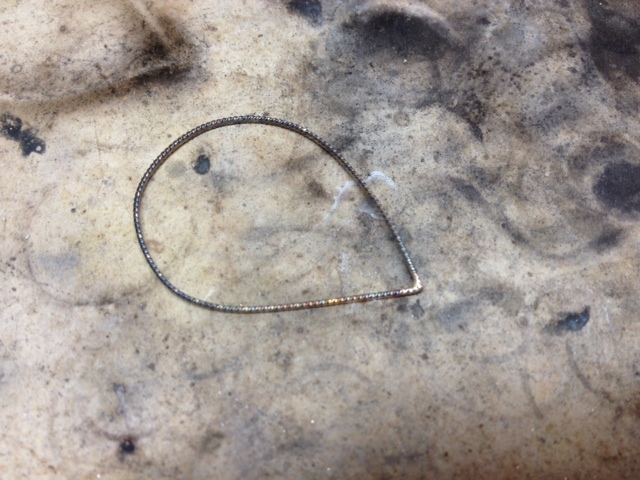 Close 4 that will be soldered into the earring and leave the remaining 2 open. 8. Solder the parts together and pickle. 9. 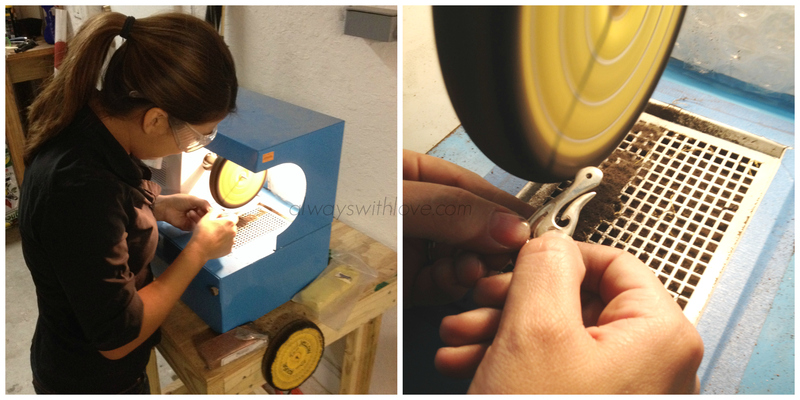 Using a brass brush in a mandrel, carefully clean between the wires. Clean in the ultrasonic for 2 minutes. 10. 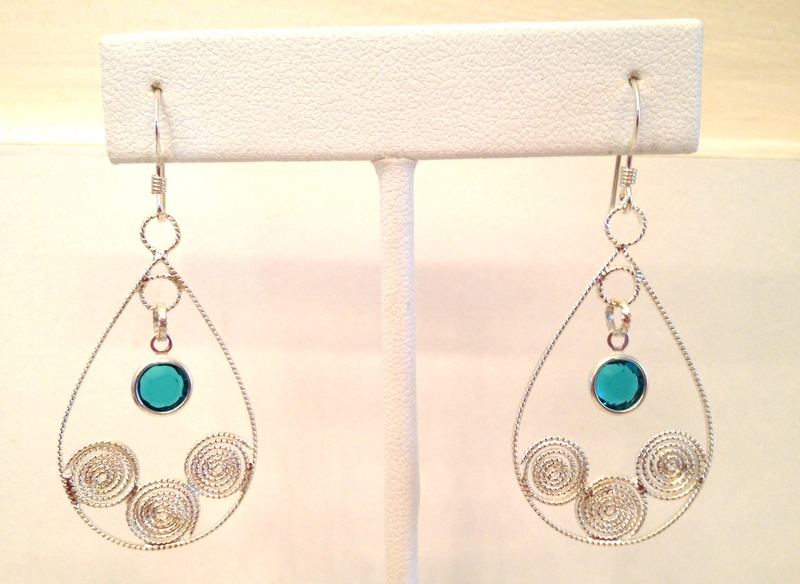 Attach the stones using the remaining 2 jump rings… and voila!